This article was originally published by The Conversation and is republished here with permission. When Americans quote writer and naturalist Henry David Thoreau, they often reach for his assertion that “In Wildness is the preservation of the world.” This phrase elicited little response when Thoreau first read it during a lecture in 1851. A century later, however, it had become a guiding mantra for the American environmental movement, adopted by the Sierra Club as an unofficial motto and launched into the cultural stratosphere via bumper stickers, T-shirts and posters. Unfortunately, the line was cherry-picked from its original context, conflates wildness with wilderness and predates Thoreau’s later, more nuanced insights about wildness. His mature views, which I stumbled onto when researching my book “The Boatman: Henry David Thoreau’s River Years,” can more effectively help us cope with a world so changed by people that geologists have proposed a new epoch, the Anthropocene. To the mature Thoreau, wildness was an entanglement of different realities and more of an attitude than an attribute. A pervasive condition lurking beneath the surface – especially in the midst of civilization. A creative force, willed not by intent but by impulse, accident and contingency. As a card-carrying geologist who has written two books on Thoreau as a natural scientist and lifelong “river rat,” and the first “Guide to Walden Pond,” I believe the mature Thoreau lurking beneath distorted cultural motifs has much to tell us. People often assume Thoreau lived in solitude at Walden for decades, but he actually spent most of his life on Concord’s Main Street. Shortly after sunset on April 23, 1851, members of the Concord Lyceum gathered at First Parish Unitarian Church. One of their most loyal members, “H. D. Thoreau,” stepped up to the podium to read his newest lecture “The Wild.” His late-spring timing was perfect, this being the wildest time of year for the romantics and naturalists of his 19th-century agroecosystem. “I wish to speak a word for Nature,” he opened boldly, “for absolute freedom and wildness, as contrasted with a freedom and culture merely civil.” Humans, he claimed, were “part and parcel of Nature, rather than a member of society.” These prophetic, inclusive statements constitute America’s declaration of interdependence. This lecture was published in The Atlantic as an essay titled “Walking” after Thoreau’s death in 1862. In it Thoreau recast the “howling wilderness” of the Puritan divines who settled Concord, Massachusetts in the mid-1630s as an ideal spiritual landscape for neo-pagans of the early 1850s. 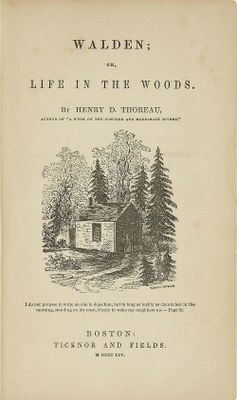 But we know from Thoreau’s voluminous writings that the insight for his “In Wildness” mantra came not from some high mountain temple, deep forest or dismal bog, but from a pair of panoramic art exhibits that Thoreau saw in late 1850 – likely in urban Boston, likely via the rattling railroad. 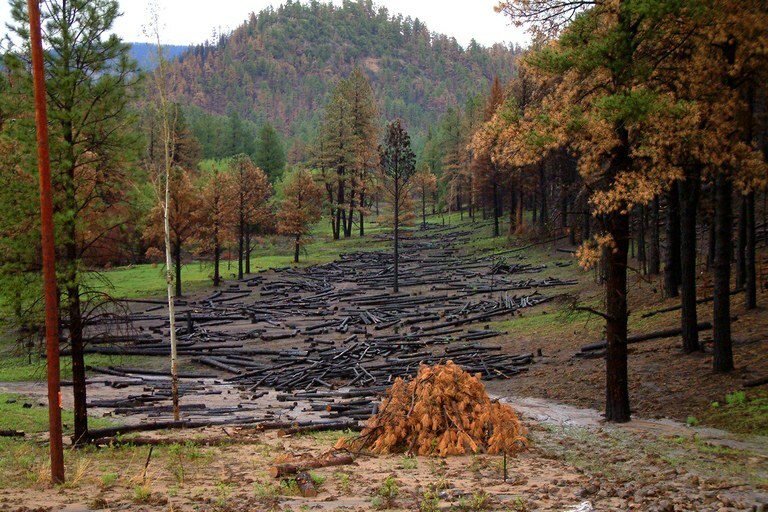 Burned logs forced down by water in Arizona’s Apache-Sitgreaves National Forest. His explanation is clear. Wildness is an attitude, a perception. “A howling wilderness does not howl,” he wrote, “it is the imagination of the traveler that does the howling.” Using his imagination, he could even find wildness in a patch of weedy ferns: “Yet how essentially wild they are! As wild, really, as those strange fossil plants whose impressions I see on my coal.” By this stage, Thoreau was finding wildness in lumps of fossil fuel. In that moment, Thoreau realized that each of his delicately balanced “skiffs” was a consequence of at least a dozen commingled cultural actions, from muskrats eating the mussels to farmers inadvertently improving mussel habitat with sediment pollution and industrialists storing and releasing hydropower to create factory goods. After this insight, Thoreau began to see his entire watershed world as a meta-consequence of three centuries’ worth of human perturbations, literally rippling through his local system along every conceivable energy gradient. For example, when monitoring stream stage to the precision of 1/64th of an inch, he realized that seemingly wild rivers mirrored the work schedules of upstream factories, and that “even the fishes” kept the Christian Sabbath. His whole local universe was ubiquitously, unpredictably, impetuously and wildly reacting to what today we call global change. As with a coin, our modern Anthropocene condition flips Thoreau’s declaration of interdependence. On its 1851 side, humans are “part and parcel” of nature as organic beings embedded within it. On its 1859 side, nature is “part and parcel” of us, hopelessly entangled and embedded in our works and residues. Fast forward to 2019. Earth’s planetary system, provoked by our overreach, is now doing its own thing in places, at scales and on schedules beyond our control. Wildness is bubbling up everywhere: Wilder fires, wilder stock markets, wilder weather, higher floods, drowning seas, collapsing ice sheets, accelerating extinctions and demographic unrest. Thoreau’s realistic, late-in-life insights can help us comprehend these ongoing Anthropocene impacts, accept responsibility for the changes coming our way, reframe them in more positive terms and reaffirm that Nature is ultimately in charge. He teaches us that wildness is much, much more than raw nature. It’s a perception emanating from our minds. A base instinct, uncluttered by rational thought. The creative genius of artistic, scientific and technological creativity. The spontaneous emergence of order from disorder, as with drifts on dry snow or the origin of life. Finally, wildness is the meta-wildness of complex, nonlinear systems, the sum total of forward-propagating, somewhat unpredictable cascades of matter and energy. The mantra “In Wildness is the preservation of the world” can remain true, provided we ask ourselves what we mean by wildness and what we’re trying to preserve. Robert M. Thorson is a professor of geology at the University of Connecticut. Email High Country News at [email protected] or submit a letter to the editor.